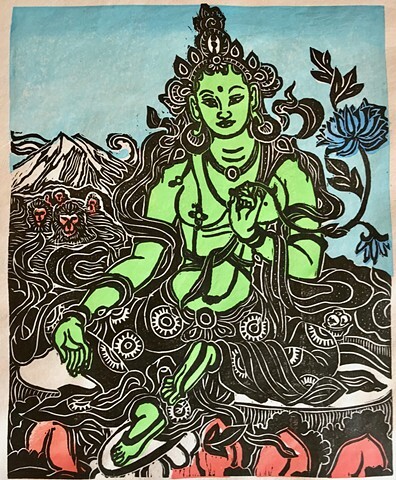 Green Tara is the Goddess of loving kindness and compassion. One foot comes down from her lotus symbolizing her readiness to come help those in need. I carved this Tara while on art residency in Japan at the base of Mount Fuji. Tara is a female Bodhisattva and an important goddess deity in both Buddhism and Hinduism. Tara represents the fundamental female aspect of the universe, which gives birth to warmth, compassion and relief from bad karma as experienced by ordinary beings in cyclic existence (samsara). She engenders, nourishes and has profound sympathy for all living beings and acts to relieve suffering wherever she can. Tara traditionally holds an utpala, or blue lotus, in her right hand at chest level, which simultaneously displays the vitarka (teaching) mudra. The utpala is a night-blooming flower. Tara protects at our time of greatest fear, during both the physical night and while we exist in the darkness of our ignorance. The lotus is renowned for its purity, remaining unstained in even the most contaminating of environments.